What is heaven? What really happens when our days here on earth come to an end? Heaven is referred to by different names: paradise, eternity, the afterlife, the new Jerusalem, resurrection. Throughout the ages Christians have wondered about it, longed for it, inquired into it, meditated on it, preached about it, and written about it in poems and songs. Some of these "wonderings" are gathered in this remarkable collection of varied passages from Christians across the centuries and from all walks of life. Brief biographies of the contributors are also included, making this book a rich resource. 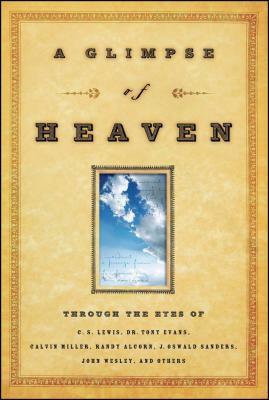 After reading A Glimpse of Heaven, you will yearn for the blessings of heaven. "Not even the most learned philosopher or theologian knows what it is going to be like. But there is one thing which the simplest Christian knows -- it is going to be all right. Somewhere, somewhen, somehow we who are worshiping God here will wake up to see Him as He is, and face to face." "What a pleasure is there in the heavenly kingdom, without fear of death; and how lofty and perpetual a happiness with eternity of living "
"The death incident is merely a passage from earth life, from the womb that has contained you until now, into the marvelous newness of heaven life." The Bible may only give us glimpses into eternity, but we can be sure of one thing: "No eye has seen, no ear has heard, no mind has conceived what God has prepared for those who love him" (1 Corinthians 2:9). From the literary and poetic to the humorous and scholarly, these classic and contemporary reflections offer a glorious wide-angled view of heaven -- full of insight, truth, hope, worship, and utter anticipation This book will focus on the hope of every believer and will comfort every heart.